It’s important that your website stays up at all times. If your site goes down you could lose business and customers. Not only that, but it makes you look unprofessional. If your site fails the check, you will receive an SMS and an email, telling you that your site is down. Then you can take the necessary steps to get your site up and running as quickly as possible. You can rest assured knowing you can rely on the fact that ManageWP is monitoring your WordPress websites and it will notify you when something goes wrong. No more checking, no more worries! 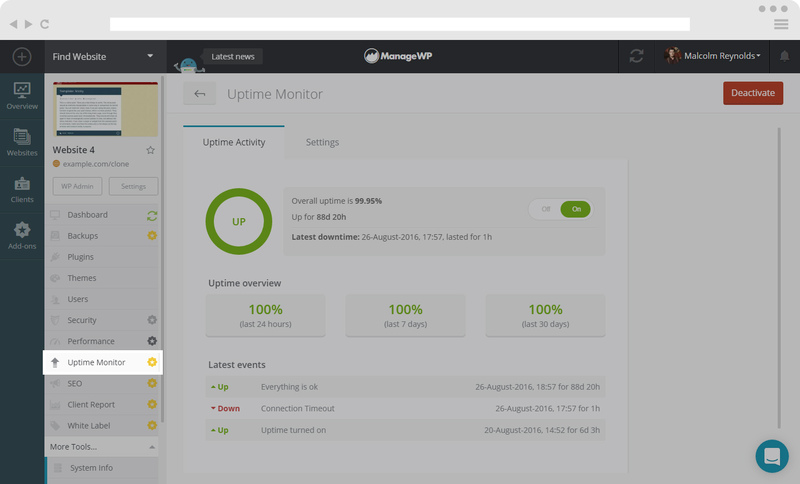 In order to find Uptime Monitoring, select the site you want to manage Uptime Monitoring on. On the left hand side menu, you will see a list of option. Click on the option Uptime Monitoring and you will see the above screen. The screen (if your Uptime Monitoring add-on is activated) will show you the percentage of your Up and Running time, if your site is Down and for how long there was a connection timeout, as well as if your site is Paused, the amount of time Uptime Monitoring is turned off. 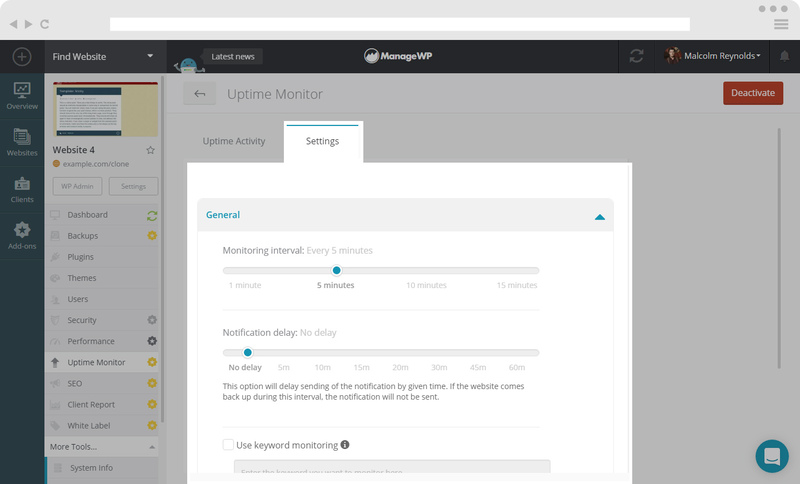 In order to setup your Uptime Monitoring, you need to select Settings. 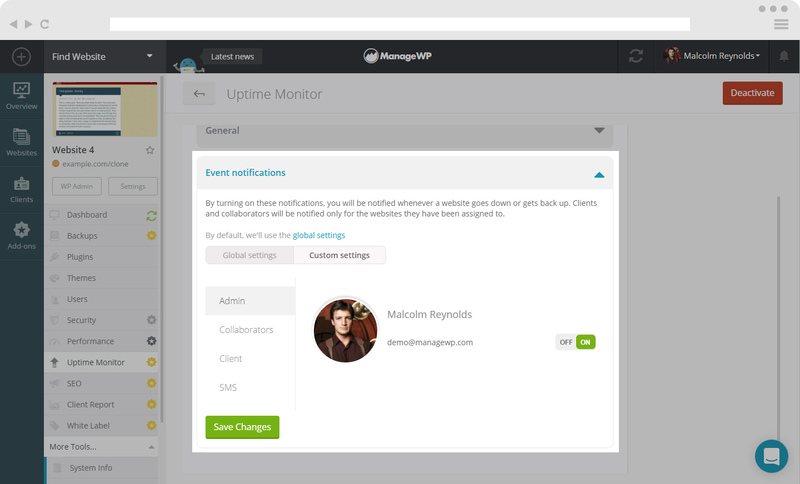 ManageWP Uptime Monitoring gives you the option of selecting the interval at which your site is monitored. You can choose between, 1 minute, 5 minutes, 10 minutes and 15 minutes. Select Keyword Monitoring when you want us to check if a specific keyword is present on your website. By default, we’ll use the global settings but if you want you can set custom event notification only for a desired website. By turning on these notifications, you will be notified whenever a website goes down or gets back up. Clients and collaborators will be notified only for the websites they have been assigned to. Here you can set custom settings for Admin, Collaborators, Client as well as SMS.